#BadPsychics: Is self proclaimed "Psychic Medium" Lorraine Ash a Racist as well as a terrible Psychic? Is self proclaimed "Psychic Medium" Lorraine Ash a Racist as well as a terrible Psychic? For those of you with a really long memory, I had a run in with Lorraine Ash nearly a decade ago. You can read all about that By Clicking Here but for once this is not about me. 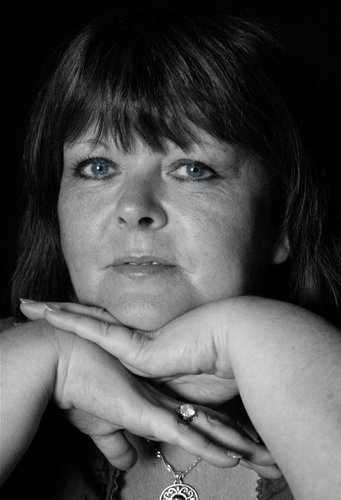 I was recently contacted by a concerned person from West Bromwich regarding a recent show they attended that featured Lorraine Ash as the main act. Now this person has asked not to be named in fear of reprisals from Lorraine Ash, or those associated with her. I have had reports in the past from people, and even other so called psychics who have told me of the kind of things Lorraine Ash has done to protect her bottom line, so I can understand the fear, and I will happily keep their name out of this report. But to make life easier, I will refer to this person as Julie. And this very post had been advertised and paid for by Lorraine Ash to appear as a "Sponsored Post" across facebook. Despite getting only 38 likes and 32 shares, this ad appeared on "Julie's" Facebook Timeline, and although Julie had visited a psychic in the past, this was her first time going to see Lorraine Ash, and Julie decided to take her young son along for company. "She happened to pick a vibe or energy from me and proceeded to give me a reading. First she asked me about violet sweets and why she kept seeing that, I said I didn't know, then she described a bible bashing church woman in a suit who came through to contact me, I told her I didn't know who she was talking about." Well the sweets are the kind of thing a psychic may come out with in a reading, but to go straight to a "Bible bashing Church woman in a suit", it's not something you hear very often, it is rather specific, although Lorraine got things wrong. "Then she kept on saying she's getting a 'V' name I said I don't know anyone with a name beginning with V so she said maybe the name had a V sound in it but didn't begin with the letter V and I couldn't think of anybody." Now I wonder if when Lorraine mentioned "Violet Sweets" she was hoping the name Violet would hit, but when it didn't she thought she would stick with the letter V. She fails again, and again. "So she starts to get really angry with me and said "I don't like these types of readings, your making me sound like I'm a liar or fake or something" . " No Lorraine Ash, you can not and should never blame your victim for making you look like a liar and a fake, you are responsible for your own actions, and to try and blame the person receiving the reading is disgraceful. "She turns to another woman she was hosting the event with and asks if she could pick up the name and the lady told her it was Veronica. I said I didn't know anybody by that name and I could see her getting worried and more and more angry." This has actually happened to me before, during a reading when the medium starts to fail badly, they try to get the help of another medium present, they usually do this to help share the blame, after all if two mediums are wrong then it must be the victims fault right! "Finally she said she's linking to a person who got shot in the neck,I said I didn't know anybody who'd been shot and she had enough and said maybe it's someone in my ex partners family or a past relative I didn't know and said she had nothing more to pass on and moved onto the next." Much like the Bible Bashing woman in a suit description earlier, we now have a really specific claim regarding someone who had been shot in the neck. Again completely wrong. But it is two really specific things that Lorraine said, and not your typical cold reading characters that psychics tend to throw out for an easy fit. "Nothing she said was right, I felt like she was cold reading because I was the only black woman in the room"
And suddenly the light bulb has gone off in your head just as it has mine. "Julie", the victim of Lorraine Ash on this Evening of Mediumship is a black woman, and the only black person other than her son in the whole room. The names Violet and Veronica are both common names in an older age range. But surely this is not enough on its own to even suggest that Lorraine is racially stereotyping a woman, it is only a name, oh wait remember what she said about a man being shot in the neck. Well if you type "West Bromwich Murder" into google, guess what you get. 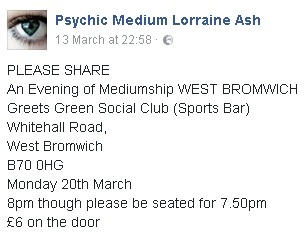 Late last year a young black man was murdered on West Bromwich High Street, not far from where this Evening of Mediumship was being held. he was shot in the side of the head. So clearly Lorraine Ash since she is from the Midlands either recalled seeing this report on the news, or just googled some reported deaths before the show, and when she saw "Julie" she assumed because she was the only black person at the show, then of course she would know this black man who was recently murdered. It is well known that all black people know each other right? No? Are you sure? "and at one point she asked another woman if there's a "K' name around her and the lady said I have a boyfriend called Kyah. She asked does he smoke weed? The girl said no so Lorraine Ash said it's around him then. Them she told the same girl "Your granddad in spirit doesn't want you with a black man, but I'm not being racist"
She then looked at me and said don't take that the wrong way, it's not me saying it I'm not racist it's spirit. She addressed me because I was the only black person in the room." You do realise that whenever some one says "I'm not being racist" they usually are being just that. "The girl told her "my partner's not black" so Lorraine Ash said to her "well you've been with someone brown before and that's what he's talking about"
I think because the girl said her boyfriend was called Kyah a black sounding name, then Lorraine Ash assumed he was black and so said that he smoked weed." It really just gets worse for Lorraine Ash doesn't it! Not only is she a terrible psychic, she also seemingly makes assumptions of race based on names and uses terrible racist stereotypes as part of her act. "I also feel that she assumed I knew I dead religious person because most elderly black people are deeply religious and so she was guessing based on that." As I said previously. Lorraine has clearly in my opinion gone beyond basic cold reading here, and moved onto racist stereotypes. I also felt singled out when she told the girl not to go out with a brown guy as I was the only black person or any other race in the room. I also feel that because I'm black she mentioned a gun and someone getting shot because in this country, gun crime to do with black males are shown alot in the news so she was stereotyping that based on my skin colour, and she assumed that there was a high probability of me knowing a gun crime victim, but I didn't know any. Especially when it seems pretty clear she assumed that Julie knew the murdered black man from West Bromwich. "When the show ended I tried to shake her hand but felt snubbed as if she was still angry at me and as I walked off, I looked back and it looked as if she was saying something nasty and spiteful about me by her facial expressions." "I tried to shake her hand after the show because I knew I annoyed her because she said I made her seem like she was lying. I just didn't want any hard feelings or bad vibes." "I got home and I felt angry that I'd just given my money away to someone who in my opinion was not the real deal. I jumped on google to see if anyone had had any bad experiences with her, I found BadPsychics and thought I would let you know my experience as it could help warn others about her..."
And with that what can I say. Lorraine Ash is a terrible psychic, and in my personal opinion she racially profiled Julie, and made some very ignorant comments which are not only offensive to the black community, but offensive to anyone who stands against bigotry and racism. For once the whole pretending to communicate with the dead while taking your money is not the most offensive thing about the psychic medium. Julie has told me she will never go to see Lorraine Ash again, and also that she doubts she will ever visit a medium again full stop, as the experience has left her feeling very upset that she could be treated in such a way. Over the many years of me doing what I do, I have a few times come across psychics racially profiling people. I myself were once racially profiled by a psychic. And in West Bromwich funnily enough. I just wish I could remember the name of the psychic but it was a long long time ago, Hell for all i know it could have been Lorraine Ash! During that reading, I was told they could see camels and the desert, Yes folks due to my dark olive tan they assumed i was of Middle Eastern ethnicity. Anyway have you had a bad experience with Lorraine Ash? If yes leave you comment below. We are also on Facebook, just search BadPsychics and you will find us. That really was a lightbulb moment. I was hella confused until you mentioned that Julie is black, ahhhhhh it makes sense now. You are black so of course you know someone that owns or has been killed by a gun. Correlation is not causality. If someone is using common names, telling something which reminds recent events or is getting impressions similar to common stereotypes, that could be just a coincidence. If you are not psychic, you cannot be sure if she was guessing by using stereotypes or if she had no clue about the stereotypes and it was just a unintentional coincidence. Coincidence could be used if the psychic was right. But she was wrong in EVERY SINGLE case here. So not sure how you are saying things are a coincidence because they are similar to common stereotypes. If she was right in the reading then yes you have an argument. But since she was 100% wrong on EVERY stereotype she used, that would point to her racially profiling the client. Again not a coincidence since she got everything wrong! "Julie" felt like she had been racially stereotyped, she was upset, offended, and hurt that she had been treated in this way. If Lorraine Ash had been correct then I accept your argument, but since she was not, your argument has no validity. Lorraine Ash in my opinion clearly racially profiled this woman, as well as someone else who gave the name of Kyah! A Name that Lorraine did NOT get, she only said a "K sounding name" which is a classic cold reading line. I am curious Gamma (Or Gemma perhaps and you messed up when signing up? ), why are you trying to defend her here? Also you say that if I am not psychic I cannot be sure.... Well no one is psychic, so I CAN be sure that Lorraine was trying to cheat here, and in doing so, she racially profile someone. If she did not racially profile Julie, then how do you explain her getting EVERYTHING so very wrong? She was in West Bromwich, a young black man had been shot weeks earlier in the side of the head. There is one black person in the crowd, and she talks about a young man being shot in the neck? I think Gamma you might be a tad blinkered here and need to be a little bit more open minded, and critical thinking. As you are making no sense in your backwards defence of her. Do these people know what they're doing and actually train for it with the purpose of fooling people or do they genuinely believe they have a gift? I'm just wondering what chain of events would lead to someone thinking they had a gift. Like cold reading, surely people must know no one is talking to them and that people are just butter in their hands. I can not think of a single situation that would make someone think that they can hear spirits other than madness. It depends on the person, sometimes they really are hearing voices due to a psychosis. The only difference here to someone who is called psychotic is that the voices aren't telling them to kill. Often it comes down to upbringing, or an interest in the subject. Interpreting imagination is often a big factor in the self delusion. In many classes where people are supposedly taught how to be mediums, it is all about allowing thoughts to come into your head and then using interpreting those thoughts, now the problem is its just imagination, but mediums believe these thoughts are coming from the dead. As for cold reading, many times people dont even realise they are doing it, they are just copying the style that they have seen another medium use, often TV mediums. They almost learn cold reading completely without realising. But in the long run everyone realises what they are doing, and like i said previously they have that day of justification whereby they reach a fork in the road and decide what route they will take. Also keep in mind that as children we have imaginary friends, now what happens if instead of growing out of it, you have a parent who is a believer, and ends up encouraging this imagination instead of telling the child the truth. The child becomes open to such delusions. I know a medium who was talking about their daughter, and how one evening the daughter got scared as she saw a shadow in her room. Instead of her mom saying it was just her imagination, her mother told her not to worry it was just a spirit guide checking on her. Yes I had a big argument and falling out with that medium when she told me this, as I pointed out she was being a bad parent and feeding a delusion in a child that could cause a lifetime of damage. So yeah when you really look into it, it is never quite as black and white as you might think looking in from the outside. Disgusting woman, why are these mediums so nasty to people who dont believe?